The Steam Workshop is full of reskins for the car boys. With the arrival of Final Fantasy 15's mod tools last month, the Steam Workshop is already rife with reskins of the game's four nice car boys and their weapons. 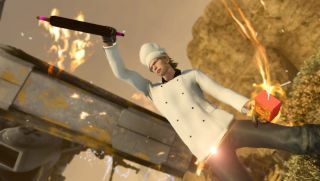 While you've got the obvious transfers of popular characters from other media and game series, you've also got a few that tap into different elements of the characters (hence Ignis's chef costume above). Here are just ten highlights we've picked out, but it's worth scanning the Workshop page to see the full range of weapons and reskins that the community has created. Special shout out to creators Jazneo and Kyriya, whose creations pop up more than once in this list. For all those Final Fantasy fans who have dreamed of Gladio rescuing them from drowning off of the Dorset coast after a failed scuba expedition (like no one I know), user Kyriya has created this lifeguard outfit. "Look ready to run down a beach in slow motion...and look good while doing it," goes the description. Indeed. This creation by Jazneo is based on the classic God of War 3 Kratos design, rather than the recent PS4 game that's generated so many insufferable dad memes. Since you do basically go to war with gods at the end of Final Fantasy 15 (well, one), this seems appropriate. There are a few versions of the Spidey suit on Steam Workshop, all by user Snacks: a mask-on version, mask-off variant and a black suit version, the latter of which probably fits Noctis's aesthetic the best. Much like that scene in Spider-Man: Homecoming where Peter finds himself in the middle of a field unable to use his web shooters, I'm not sure how useful Spidey's powers would even be outside the city of Insomnia in FF15, but the costumes do look the part here. Ignis's cooking is one of the best parts of FF15, and this skin by Kyriya allows you to take that to its natural conclusion. It's a nice-looking outfit, and the best part is you can combo it with Hot Sauce and rolling pin weapons, also made by Kyriya. User AaronTheSnob has created this fully rigged Solid Snake costume mod, based on an original model rip by MrGameboy20XX. He looks far too happy on that Chocobo for my liking, but hey, maybe Snake's more into human companionship these days. Snake can be combined with his memorable SOCOM pistol and a CQC knife as part of this mod pack. Squall and Noctis are both unmistakeably Tetsuya Nomura creations, and this mod by Jazneo lets you swap one for the other. Mods also exist for Final Fantasy characters like Lightning and Cloud, as well as their numerous weapons. It's been over five years since the last Devil May Cry game, and next year we'll finally get to play a new one. In the meantime, this mod by Jazneo captures the Son of Sparta as he looked in DMC4, complete with working physics on his coat when he moves. You can swap him in for Noctis or Gladio. For a really deep cut, you can get Dante as he looked in Shin Megami Tensei: Nocturne when he appeared as a guest character. I could never work out if FF15's Bahamut was actually a dragon or just a large man dressed as a dragon. In the case of Kou153's mod, there's no ambiguity: Noctis is cosplaying as probably the most famous summon from the entire series. I think it's a bit garish to wear on a road trip, but what do I know. There's something about swapping FF15's affable chef for Freddy Krueger that I find mildly disturbing, especially when he's following you around at night. A Michael Myers mod is also available for Gladio, if you want more horror icons (who have mostly been robbed of their scary powers after years of dreadful sequels) in your crew. HAL's Ifrit outfit gives the mild-mannered chef a fiery makeover. You never really get to see enough of Final Fantasy 15's gorgeous summon creatures throughout the game, which seems like a waste, so dressing them up as such seems like the next best thing.